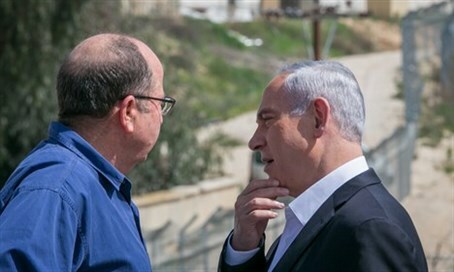 As talks with Liberman progress, Netanyahu informs Yaalon he may lose Defense Ministry. Prime Minister Binyamin Netanyahu on Wednesday put Defense Minister Moshe Yaalon on notice that he may soon have to vacate his position. As talks between Netanyahu and Yisrael Beytenu chief Avigdor Liberman progressed on Wednesday, Netanyahu informed Yaalon that he was offering control of the Defense Ministry to former Foreign Minister Liberman. A spokesperson for Yaalon claimed that the minister had received no message indicating the Prime Minister intended to offer Liberman the Defense Ministry. Earlier on Wednesday, Zionist Union leader Isaac Herzog rejected the possibility of joining the coalition, should Liberman’s party enter the government. On Wednesday, Liberman held a press conference laying out his terms for joining Netanyahu’s governing coalition. Shortly thereafter the Prime Minister extended an invitation to Liberman to discuss the possibility of bringing the Yisrael Beytenu party into the coalition. Liberman’s sudden willingness to negotiate has thrown the Zionist Union party into chaos, effectively ending talks for a broad coalition with the leftwing faction. Herzog had struggled to win over support within his own party for a unity government as weeks of negotiations appeared to be close to fruition. Several Zionist Union MKs called for Herzog’s resignation on Wednesday, claiming that his efforts to bring the party into the coalition had cost him the public’s trust. Another Zionist Union MK, Mickey Rosenthal, echoed Shaffir’s sentiments.